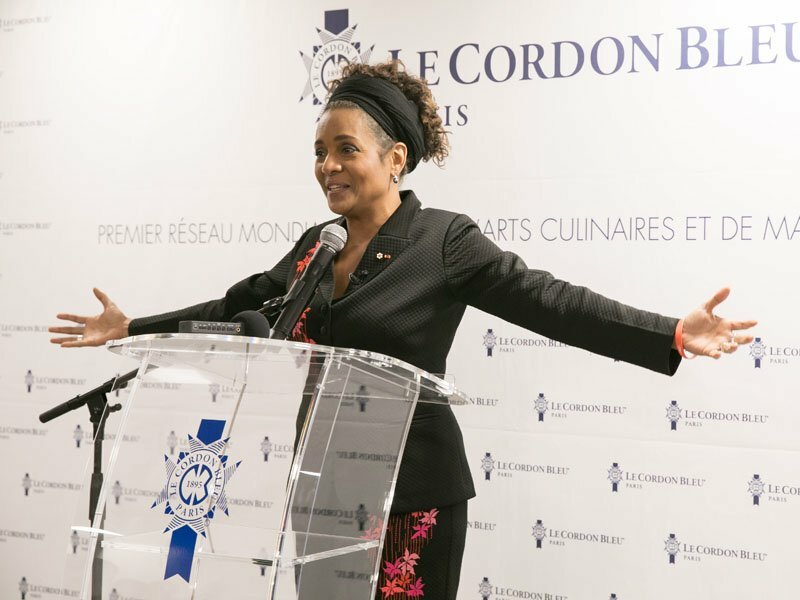 March 24 2017: Le Cordon Bleu institute celebrates the end of French Language and Francophonie Week and, for the first time, welcomes H.E Mrs. Michaëlle Jean, General Secretary of La Francophonie as well as members and employees from the Organisation of La Francophonie (OIF) and its operators such as TV5Monde, the Academic Agency of La Francophonie (AUF), the International Association of Francophone Mayors (AIMF) and the Senghor University of Alexandria. Mr. André Cointreau, Le Cordon Bleu International President, founding member of the Alliance française Foundation and member of the board of the Alliance française for 25 years, emphasizes his desire to share the universal values of La Francophonie to the 350 guests including 30 foreign ambassadors in France. Le Cordon Bleu wishes to develop culinary education notably in Africa, the continent of Francophonie par excellence, which has a very rich culinary heritage. With a network of more than 35 institutes located in 20 countries, Le Cordon Bleu participates in training young individuals, serving men and women around the globe. 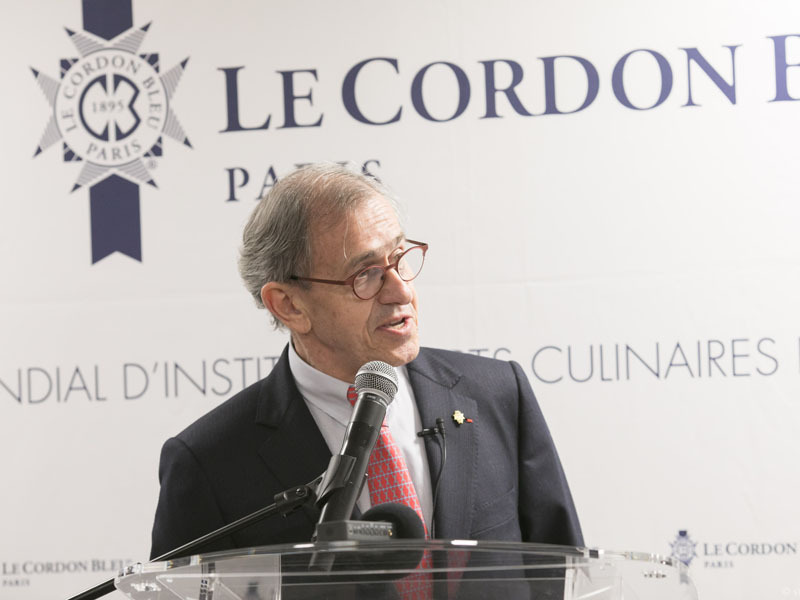 Le Cordon Bleu showcases their local cuisines and culinary traditions, contributing to the economic, linguistic and cultural enhancement of both their countries and of France. This is how Le Cordon Bleu attempts to give “a better taste to the world”. This exceptional evening features a kaleidoscope of buffets and culinary specialities, from countries who speak and promote French, including Canada, Senegal, Korea, to name but a few, which have been prepared and organized by Executive Chef and Culinary Arts Director, Eric Briffard, One of the Best Craftsmen in France (Meilleur Ouvrier de France - MOF), Chef Philippe Groult (MOF), Chef Fabrice Danniel and their teams. The Chefs are assisted by students representing all the countries currently studying at the Institute, and 5 pyramids of macaroons in the 5 colours of the OIF take pride of place. During the event, the Chefs have chosen to present ‘Le patrimoine culinaire de l’Afrique’ (Africa’s culinary heritage) (Editions Michel Lafon). This book was written by Chef Christian Abegan, ambassador of African culinary arts, born in Cameroon and Le Cordon Bleu Paris 1991 alumnus. 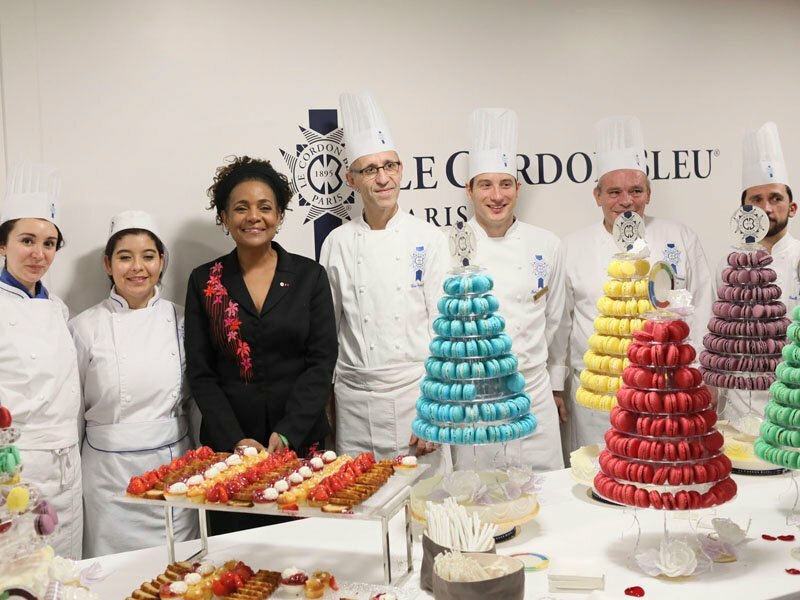 Since it was founded in 1895, Le Cordon Bleu Paris institute has attracted with its training programmes many Francophiles looking for an authentic experience in France. Students learn that culinary vocabulary in all types of world cuisine used by chefs is often composed of French words and this helps to showcase the speaking and promotion of French around the globe. Some members of the International Organisation of La Francophonie are back in their former premises. Le Cordon Bleu institute did, in fact, move in to the previous Head Office of the Agency of Cultural and Technical Cooperation (ACCT) and of the Intergovernmental organisation of French-speaking nations (AIF) which went on to become the International Organisation of La Francophonie. Under the impetus of H.E Mrs. Michaëlle Jean, the theme of International Francophonie Day 2017, revolves around the theme “I like, I share # my 20March”. 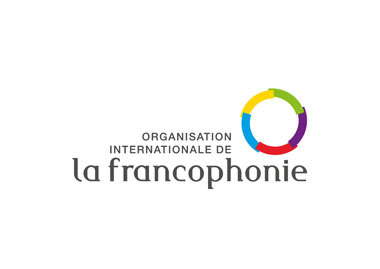 International Francophonie Day is celebrated on the 5 continents on 20 March every year. The events organized aim to celebrate and promote French culture and language. Today, French is spoken by 280 million people around the globe which includes individuals from 84 states and governments who are members of the OIF.